I’m in the back seat of a yellow school bus crammed with Folk Fest attendees, listening to podcasts on my phone before a day of listening to music. The air is warm and close and smells of sunscreen, hot pavement, and the exhaust of city traffic. We pull out onto the highway, and Esther Perel’s voice is in my ears as the trees rush past. The bus eases up to the shuttle stop and everyone squeezes out, mini-coolers, camping chairs, and bags in tow. It’s hot, high noon. 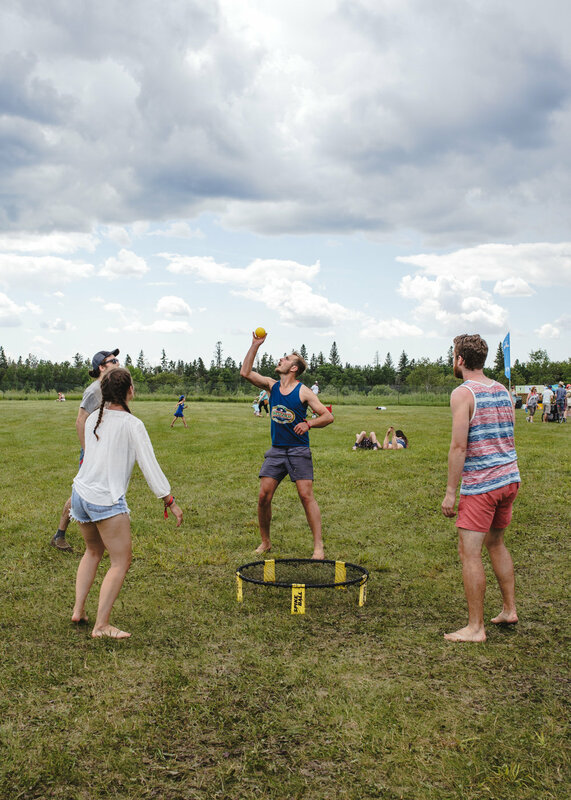 Beads of sweat begin collecting on my lower back and upper lip as I stroll past campers and attendees in various states of dress and undress toward the festival entrance. 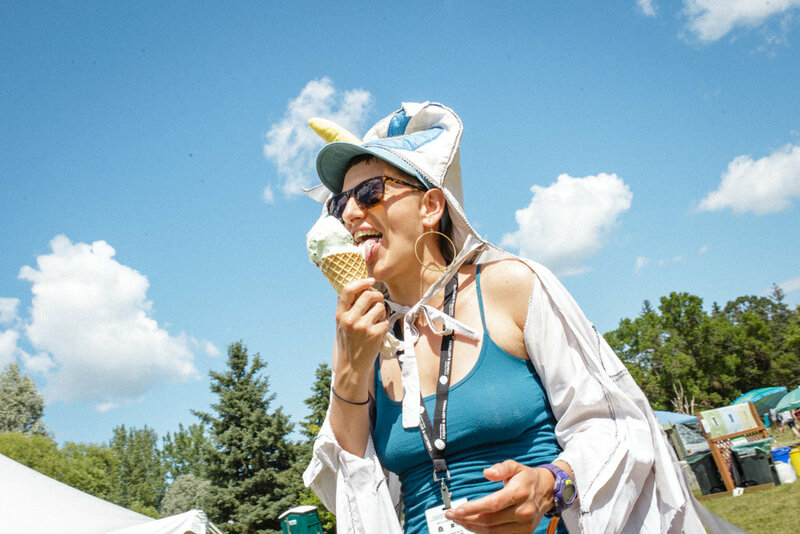 I spend two days at the Winnipeg Folk Festival — lying in the sun listening to music, strolling around the grounds and running into pals from the city, hiding behind my camera, eating perogies and popsicles in the shade, conducting interviews — and what I’m most struck by is how peacefully everything coexists. Kids tear around, playing games of their own invention, folks doze lazily in the shade while others tear it up on their own private dance floor, volunteers bustle around mid-task. Sitting quietly in the Shady Grove, I overhear a guy describe to his friends the specific regimen of alcohol and water that take him through the night and into the next day. He calls this time of year a fresh start, “like a rebirth.” A few feet away friends take selfies with echoes of “That’s cute.” A couple blankets over, a child with a dragonfly painted across her face dozes on her dad’s shoulder. Somehow it all just hangs together. 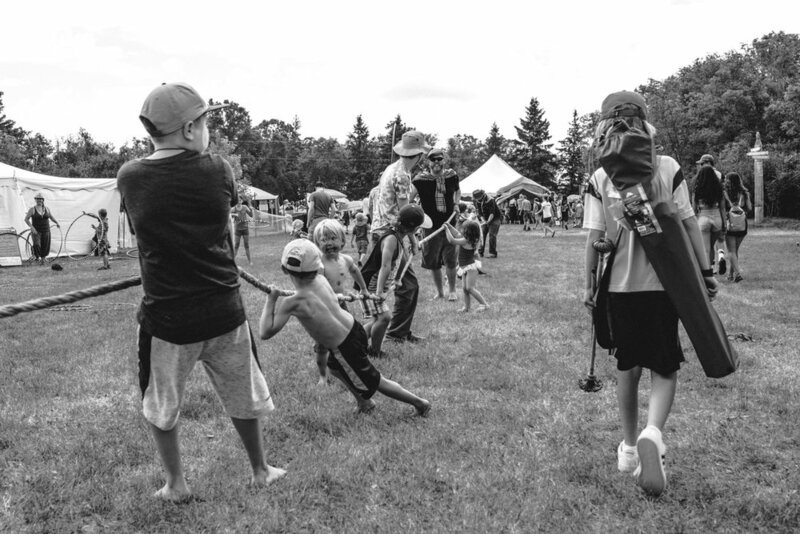 Later, I sit down with Lorna Hiebert, who’s been volunteering and working with the Winnipeg Folk Festival off and on since it started in 1974. 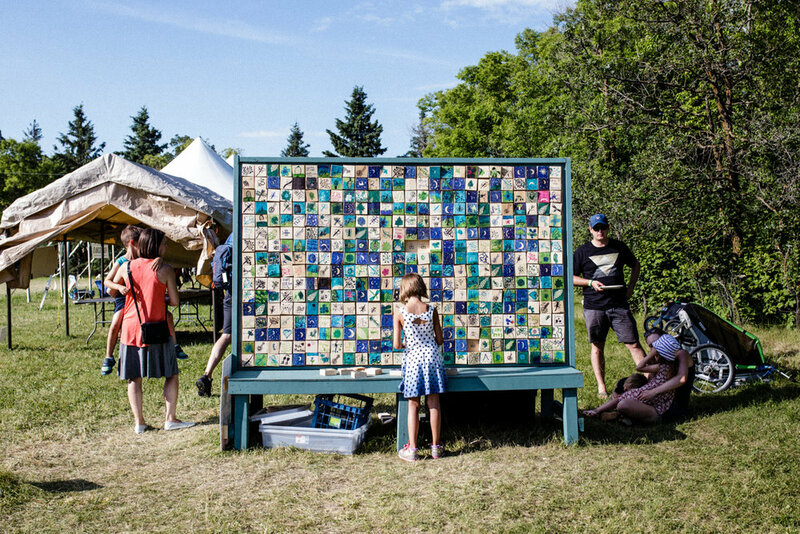 She founded the Hand-made Village together with Rosie Neufeld and spent ten years running the Main Stage before moving out to Montreal then the west coast, coming back most summers to help out. 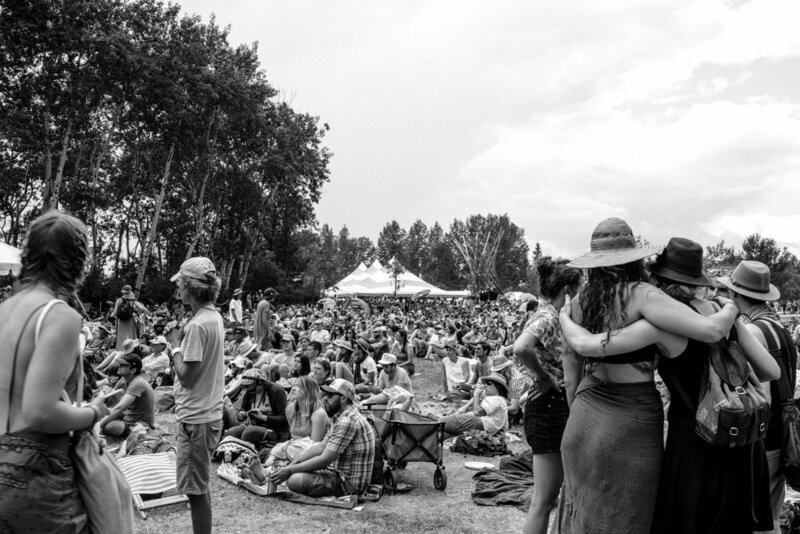 She also worked with the festival’s key founder, Mitch Podolak, to found the Vancouver Folk Fest. On this particular weekend, I catch her on a break from watching her niece’s children. Lorna’s niece and her husband are busy working the festival. 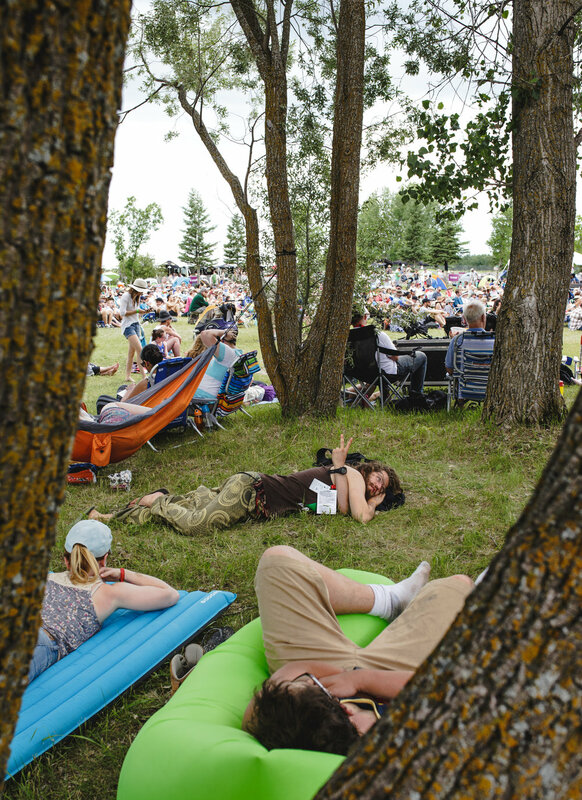 FULL: You’ve been here from the beginning, so tell me a little bit about how the Winnipeg Folk Festival got started. Lorna Hiebert: The first year was almost a two-year process — have meetings, getting the funding. The main impetus for it was the centennial year. There was centennial money, which gave us a little chunk, but it was only the start. We had to go find other people and organizations to help us. In the Winnipeg community, everybody knows everybody, so it’s not that difficult to get people interested, getting the money is the harder part. Mitch Podolak was really the driving force. He still has a lot of of influence to this day. He also started the West End Cultural Centre, and he and his wife Ava Kobrinsky started Home Routes, the home concert series. Those are things that never existed before. He knew everybody and every time we met interested people, they would bring more people in. It wasn’t just five people who started it. FULL: What are some of the different jobs you’ve done over your years of involvement? LH: At the beginning, we were only three people on staff, so it’s hard to describe what you actually did, because you just sort of fill in the blanks. What we did a lot of was organizing the volunteer crews. Mitch had been to all the big festivals, and he knew how to organize them. He knew the structure that you needed, and that takes time to figure out. In the beginning, it was really hard. We did a lot of fundraising. The first year was a free festival down by the beach. After that, people liked it so much, and we thought it was fun, and wanted to do it again. The first five years, we had a lot of difficulty because we had to get more funding and we had a lot of rain. One weekend it rained all day every day. Sometimes we’d only have enough to pay the rent on the building we were in and maybe fill the postage meter so we could send out more requests for money. For me, that was one of the hardest parts, because you’re working so much, always in a state of tension, and you’re trying to keep good people motivated and attract qualified people. When we were physically out here, we didn’t have many shelters. We were in mud all the time sliding. There’s been so many improvements since then. Physically and motivationally, it was really hard to keep it going. But the people who stuck around, they were there for life. You still see a lot of the same people volunteering. They’re amazing and they’ll bring other people with them. We’ve got 3,500 volunteers now. 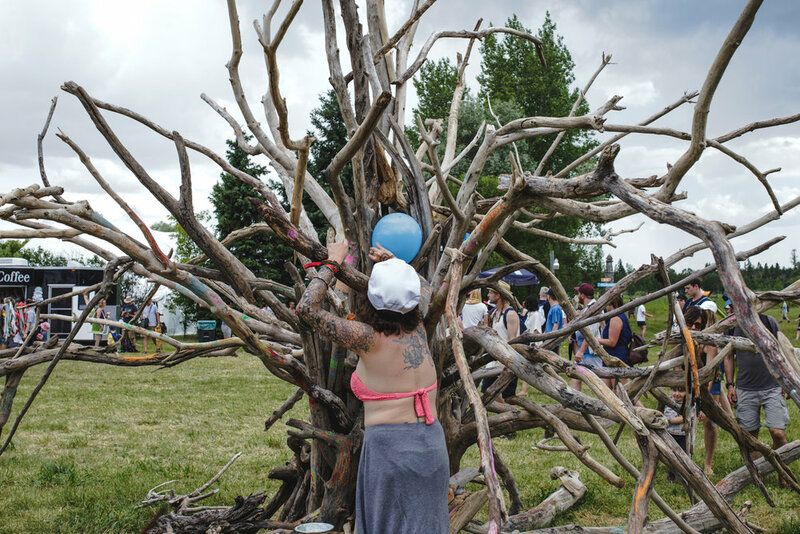 Once you have that infrastructure set up on paper, the part of the festival that shows up and does exactly what it said it would do and then disappears until next year, it’s almost like magic. The crews now are so big, but people really seem to stick together. FULL: Folk is usually connected to a sense of grass-roots or community, and can often be wary of something big and highly professional. I’m curious how you maintain that folk spirit as it grows. LH: I think it’s in the personalities of the people. I don’t think it’s just the volunteers, I think it’s Winnipeg that has that. Winnipeg is so interconnected. If we talked a few minutes, I’m sure I would know people that you know. It’s just that kind of a city -- you’re constantly running into people. And the volunteers have fun when they come out here. They have reasonable hours and lots of time to enjoy the event. I don’t want to just go from stage to stage listening to music, I want to do something and really be involved. You get hooked on it. Some people have been coming out to volunteer since the festival started. They’re not always as physically able to do the things they could forty years ago, but if they’re motivated volunteers, they’ll do other jobs that are less physical. That’s a huge part of it, because they train the new ones too. What impresses me the most is how dedicated people are. People will move away and then take their vacations to come out here and volunteer all weekend. Maybe they’ll have an extra day in Winnipeg, but this is why they’re here. They’ll see all their friends. This becomes its own family. 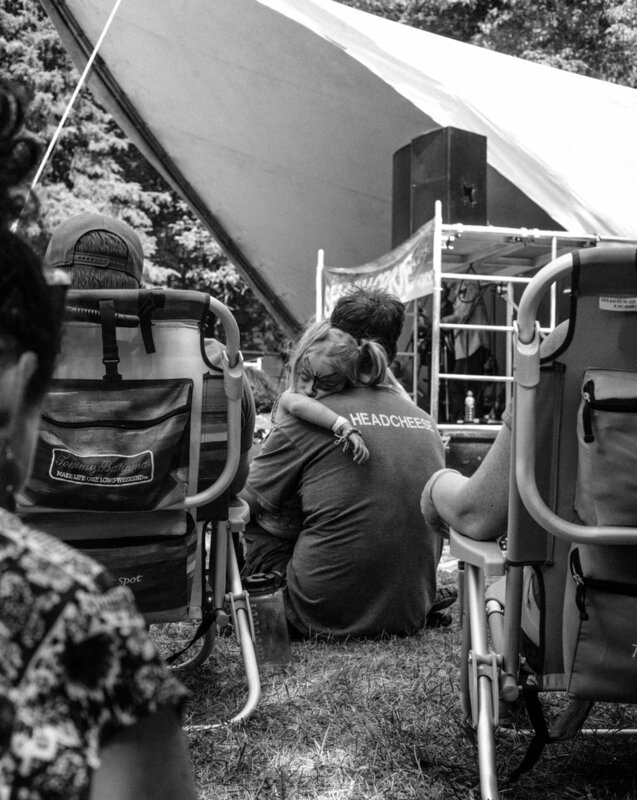 Sometimes you’re close friends with people, but you don’t see them any other time of the year but Folk Fest. You come out here, and it’s like you saw them yesterday. It’s not the same as being in a city and visiting a bunch of people. This world is something else. It’s like a time capsule. FULL: I think that’s something you see in a successful festival, is that it feels like you’re somewhere else in a really palpable way. LH: Time stops. You have your Monday, Tuesday, Wednesday getting ready, anticipating the festival. And then Wednesday, there’s five thousand people camping and setting up. Wednesday to Sunday night, you’re completely in a different world. And then the weekend stops and you have to get back into your regular life again. That’s the hard part. FULL: I think part of what makes it feel like you’re in a completely different place even when you’re close to Winnipeg is in the mentality the people here. People seem to treat each other in a way that’s not fear-based, just friendly, nice and open, and that’s part of why it feels like you’re in another world. LH: Just looks at all the kids that are running around! Even today, when we were coming in, my grand-nephew was running ahead maybe twenty or thirty steps. He seemed to be alone, and these two little boys, maybe ten or twelve years old, were looking at him and looking around. When we came by, they asked us, “Do you know whose kid that is?” They were going to find out who he belonged to even though they didn’t know him. Boys that age, you don’t think they even notice that kind of stuff. There are stories like that all the time. FULL: Tell me about the Apprentice Program for volunteers. LH: It’s one of the ways that we get our volunteers more involved. The parents who started out being volunteers have had kids along the way, so now we have a crew between 12 and 17. Karen Dana, who runs the crew, is a guidance counsellor, and she really knows how to be with kids. She’ll take them around and give them a list of things to do every day. They’ve already been here their whole lives anyway when their parents are volunteering, so they can’t think of anything else but to do but that. You’re already building your base that way. They go back to school, talk to their friends, and tell them to come out. I used to worry what would happen when the founders all got old. Now we’ve got a little bit of everything in terms of music, and that’s what’s bringing people in who didn’t necessarily grow up hearing it. I’m amazed to see how many new people are here every year. They’re building their own kind of audience. One of the things that surprises me the most is how it’s still full every year. Sometimes it’s almost unbearably full. Because when you start something out like that, you don’t think what it’s going to be like thirty years from now. You’re just happy you can keep it going. And all of the sudden you’re celebrating your fortieth anniversary. FULL: It’s become such an established thing, whereas before you wouldn’t know if you even had money to keep it going. LH: The first ten, twelve years, that was the number one thing. If you had a bad weekend, you would wonder if people would come back. We had a lot of bad weekends in a row. That’s the thing I appreciate the most, is that it’s sustainable now. It’s like bringing a child into the world and it’s grown into an adult. 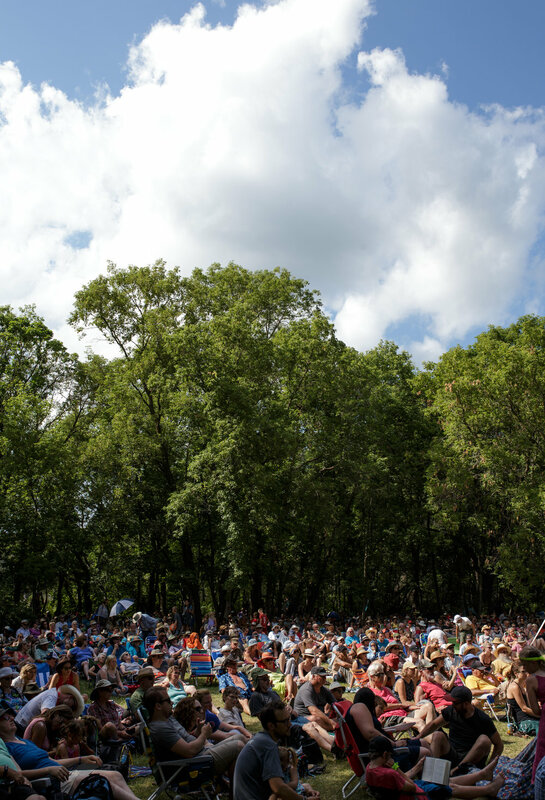 To learn more about The Winnipeg Folk Festival, visit their website.